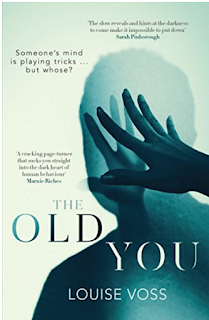 Orenda Books brought the new psychological thriller from Louise Voss across the Atlantic for the start of January, and it's a compulsive -- even propulsive (!) read. THE OLD YOU sets up a classic moment in the life of a couple, Lynn and Ed Naismith. Just as Louise starts a new teaching job, her husband's fumbling errors in words and ideas gets labeled with a diagnosis: a progressive dementia, untreatable and irreversible. What makes this into a fascinating work of crime fiction and suspense is the change of character happening to Lynn's husband: violence at a level that forces her into a separate bedroom, and raises dark questions about his past. But it goes way past there -- Voss is a seasoned British thriller author, and she rapidly erects a maze of threat and risk around Lynn, where far more than her marriage is disintegrating. If you're a Barbara Vine fan, grab this one. The situation's provocative, the secrets dark, and the suspense demanding and well paced. The author's website is out of date; check out the Louise Voss Facebook page instead.